I have received a couple questions regarding the Neoclassical style. I will try to answer them the best that I can . Neo Classical is a pretty tough style to master, and this lesson is written as my method of composing in that style. You may have other ideas and insight in this and by all means use them. Hopefully I can help out some, but what your getting is my style and a few ideas that I rely on for composing. There are volumes of books written about classical music, and so much information that goes back hundreds of years that I can’t really even scratch the surface, but hopefully I can clear up some basic questions. Neo Classical style as most of us think about is shred guitar like Yngwie Malmsteen who hit the scene and revolutionized guitar soloing. He used classical ideas in his soloing, improvisation, and composing. There were some guitarists doing this before him, but for the most part rock guitar was based of minor pent atonics and blues based forms. Ok to get to the roots of this genre- it probably would not hurt to listen to some Bach, and Paganini and other classical composers from that era. Absorb some of the ideas for your own playing. Well here goes, my attempt at this brief tutorial. Harmonic minor is a prevalent scale in this style, Malmsteen uses it quite a bit. However, just blasting up and down the scale will not do a thing for you, that was a mistake that a lot of people make (including myself) when trying to initially grasp this style, all it ends up with is you sounding like your running up and down a scale. 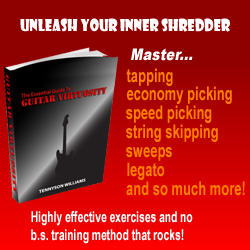 Instead come up with some licks based on that scale and try to incorporate them into your writings. Little licks that you think sound cool, and can play . The more you memorize these little patterns the easier it will be to throw them out in improvised solos. Not only is the Harmonic minor scale you can compose with a lot of other scales, one of my favorites is to use chromatics now and then, When the need calls for it a out of ordinary note will get things noticed. Other scales you can use are the Major, Natural Minor, Phrygian-dominant scale, chromatic, Modes etc. – You can even use the Major/minor pent atonics and blues scales now and then. A very important think to remember is that there are 12 notes in all (chromatic) – it is up to you to choose what you want to use. Scales are a tool, they can be a guideline of the proper notes. But you in the end have to select what notes you want to use. It’s not really the particular scale that makes it sound neoclassical, more of how to use the notes within that scale, but that being said you can always go back to the harmonic minor for ideas. I find the key that I want the song to be in – and try to form a riff that conveys the mood. Of my desired sound. You can move the riff around also. Well chords to select from, I prefer to use a lot of minors, well actually the riffs are normally based on minor scales, so I try to match them up. I found that in my experience, this is not really a chord strumming type of music. So while know the chords, and stuff is needed for the riff and solos. Strumming for example an open G maj is not going to sound neoclassical in most cases. I guess along in the category with chords we can lump sweeping, as it is I found best to sweep the chord arpeggios that go with the riffs. So sweeping does not automatically make it neoclassical, in fact many of my songs don’t have sweeping in them. I tend to use sweeping when I want that type of sound, rather than doing it for the sake of being able to. My patterns for sweep are mostly on the chord that will work with the note than I am playing at the moment that the passage needs it. Always try to alternate pick single string passages, unless your going to the next string and you want to sweep it across, then use sweeping. This becomes what they call economy picking- it all has its own sounds and places were you should use them. Now here we go, a important aspect of this type of music is the use of counterpoint in your compositions. This is also known as call and answer and some other names that it may go bay. Anyway play a phrase with your guitar don’t resolve it (complete it), but bring it up and leave it. Now bring it down to resolve it, but do it an octave higher. Normally it is the communication between to instruments that do this, but you can do it yourself with practice, my example was mostly to demonstrate what it was in general. Not all neoclassical has to be shred, some of the stuff I wrote moves along at a slow rate and is designed to sound smooth and easy. I guess it is important to know when not to play and to let the music breathe as well as when to shred it out. Slow playing balanced with fast will work well with each other. Scales, sweeps , technique are all ways we used to communicate – but we have to learn to put it together. By blasting a bunch of scales at top speed you may end up sounding like your babbling a bunch of words in the dictionary, but they make no sense. I write with mood in mind, anger, joy, sadness, etc. the sounds I play I attempt to make this point. Sometimes, if your stuck with no ideas – make up a name for your song first, try to have the name convey the message of your song. It may sound stupid, but if you have it named you will tend to go with the mood that was placed by the title. Ok so you have your mood – Write your riff with that feeling in mind. Make your song try to sound like what your feeling. – Use the interlude to break up the song either as a climax or anticlimax. Solo with the mood in mind , much like the riff the solo should have a message- Think of the solo as a story within the song, let it ebb and flow with the song – bring it to a climax – and let it have a point. Writing a song or solo is like what they teach you in English class for writing stories. Well the song is your story and the instrument is the paper and pen. I will try to touch on more of this style of music in future articles. There is a lot of ideas, and technique that I can’t really sum up in the short article here, if you want more details or help email me taylorsnyderband@yahoo.com and I will be more than happy to write you back and help with whatever you may need.